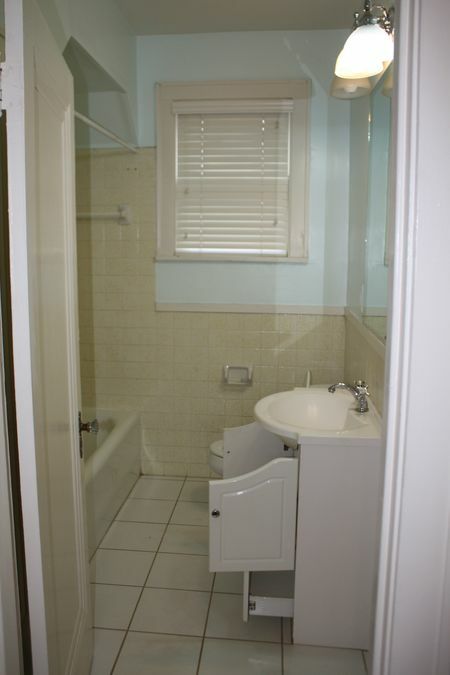 When we bought this little cottage we knew bathrooms would be an issue. We chose neighborhood over square footage and other amenities. So basically everything is tiny. I know it won't be long before we outgrow this but I love living small. It's the ultimate challenge- trying to make the most of every square inch. 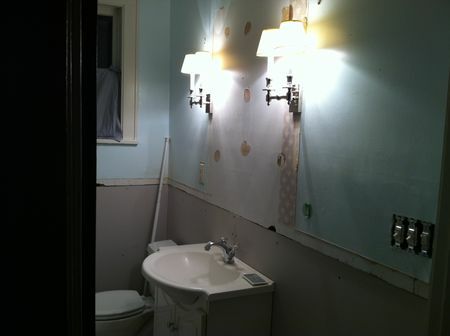 The main floor bathroom was... not pretty. It was definitely liveable but the textured yellow wall tiles made me cringe every time I went in there. I was planning on having someone come reglaze the tile (more cost effective) when all of a sudden- OOPS- sledge hammer to the wall. And then OOPS, it fell on the floor! Only to find yet another layer of textured tile underneath. So I picked out some pretty marble basketweave tile for the floors, white subway tile for the tub surround and put the tile guys to work. As you can see one of the very first things I did was change the lighting- because it's always the most crucial! I had the overhead light moved and installed double sconces instead. 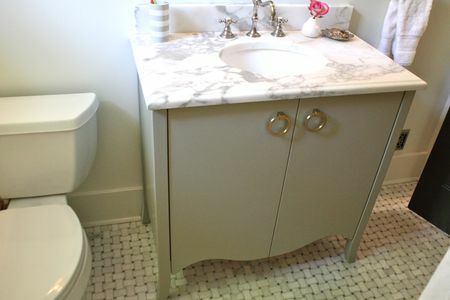 TIP: When the space allows always put sconces on the sides of your vanity- 66" off of the floor. It provides much more flattering light. I then drew up something for my cabinet guy to build, found a calcutta gold remnant (I couldn't resist), and ordered polished nickel fixtures. I wanted to dress up the vanity with some funky mismatched jewelry so I found some oversized brass pulls from Liz's Antique Hardware. The mirror is from Ballard Designs. I love it. 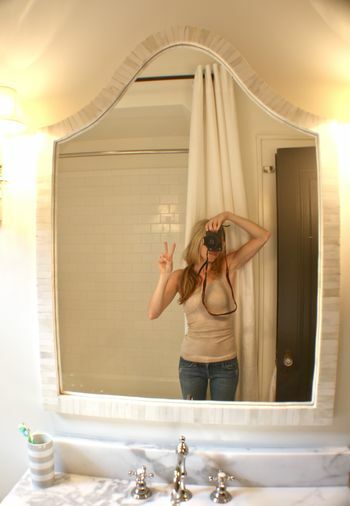 See shower behind me: I hung a shower curtain liner at regular height on a tension rod. I then installed a drapery rod up really high and got (3) white linen curtain panels from West Elm that ended up matching the wall color. Since this is the bathroom guests will most likely use when we are entertaining I wanted to be able to cover up the bathtub completely. We don't always close it but when we do it instantly makes the room feel cleaner and more elegant. Oh and just recently I put up some cafe curtains for privacy. 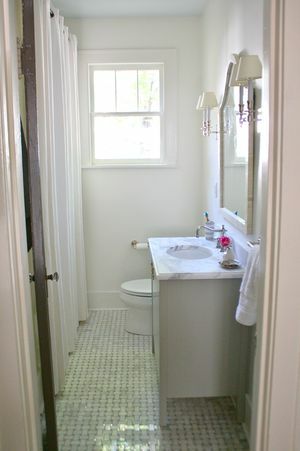 - Always put all lights on dimmers- yes, even in bathrooms. - When it comes to subs don't settle for the answer: "It's just an old house". That is sometimes just an excuse. 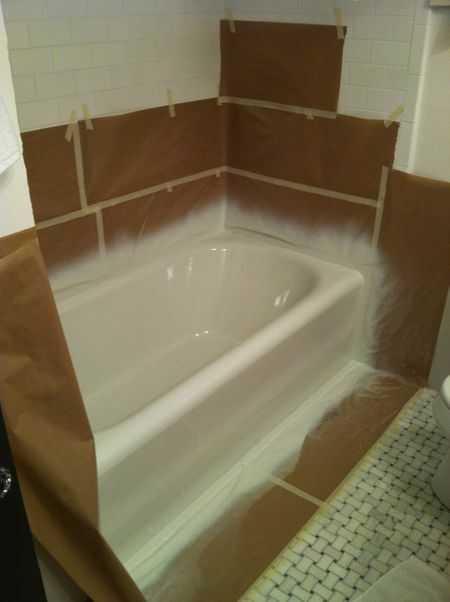 -bathroom renovations take a lot longer than you expect- if they say 3-4 weeks that's a lie. - Don't use tension rods. Go ahead and get one permanently installed to the tile. - Don't have your husband or brother install your toilet paper holder on a newly painted wall- because they'll probably install it crooked and leave pencil marks that you stare at every day. - Check to make sure your faucet spout doesn't come too far out into the sink- or you'll hit your head when washing your face. - Oh and that air register cover in picture below? That little detail makes me happy.These random vents in old houses will make you crazy- until you realize that instead of trying to cover it up with plastic you should just Own it and do something decorative. Restoration Hardware's register cover in satin nickel. - Despite what anyone says... 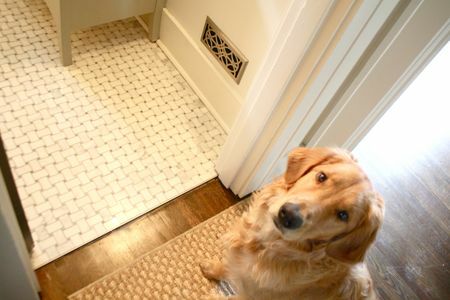 If your dog insists on resting under your feet everytime you're in the bathroom it's NOT because of the cold tile- it's because he loves you! 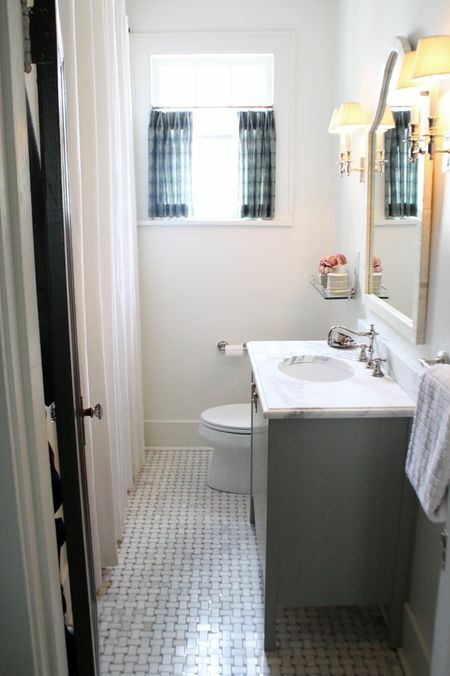 What valuable lessons have you learned through renovating bathrooms? small spaces? Would love to hear.